Home→Blade & Crown updates→Blade & Crown Open Thread 1: How are you using it? After some discussion last month, I realized that there’s no designated place on this blog to discuss Blade & Crown. So, with no further ado, here’s an open thread to do just that. 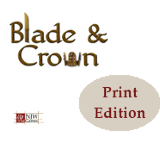 And here’s a discussion topic to start things off: What are you doing with Blade & Crown? Are you running games? Playing in a game? Planning something? What setting(s) are you using with it? Are you reading it? Using it for inspiration? I’d love to hear your answers! Every time I see “A Game of Thrones” I think “Blade & Crown” is the perfect game for this setting.